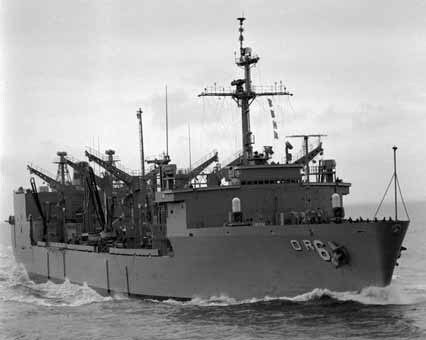 The USS KALAMAZOO (AOR-6), a Wichita-class replenishment oiler, was commissioned on 11 AUG 1973. Built at the General Dynamics Shipyard in Quincy, Mass., USS KALAMAZOO, after fit out and shake down, joined the Atlantic Fleet and was homeported in Mayport, Florida. During KALAMAZOO's career she performed all the duties required of an Atlantic "UNREP"; deployments to the Caribbean, Mediterranean, the North and South Atlantic and to the Indian Ocean during Desert Storm in 1991. USS KALAMAZOO served her country for 23 years and 5 days, until decommissioned on 16 AUG 1996. At first laid up ad the NISMF at Ft. Eustis, VA, the hulk of the KALAMAZOO was scrapped in 2008 by ESCO Marine of Brownsville, TX. DEC 1982 - JUN 1983 OVERHAUL-HOBOKEN N.J.